Researchers have made a diode from DNA, pushing the boundaries of computing power even farther. Ever since the development of the first computer, technology has been moving toward making electronics smaller and packing more juice into them. This has led to the development of nanoelectronics, molecules and atoms that act in a way similar to large electronic components. Typically, these are several atoms or molecules cobbled together. Now, another milestone in that direction has been achieved. In a study published online in Nature Chemistry, researchers from the US and Israel say they have developed the world’s smallest diode, the size of a single molecule. 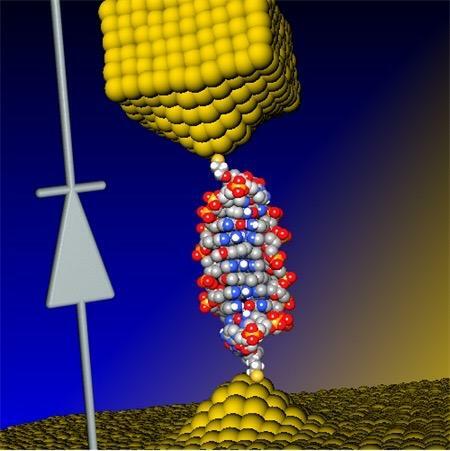 Depiction of the newly created, single molecule diode, illustrating the “coralyne-intercalated DNA junction.” Credit: U. Georgia/Ben-Gurion U. The newly developed nanoscale diode functions as a valve, enabling the flow of an electric current in a single direction. These nanoscale diodes have properties that resemble traditional electronic components such as wires, transistors or rectifiers. Such a diode may be a way to surmount the diminishing power of Moore’s Law—which holds that the number of transistors in a circuit has doubled approximately every two years—beyond what silicon integrated circuits can attain. The development of computing technology has been toward molecules with interesting properties and mixing them together, creating analogs for conventional electronic elements at the molecular scale. The researchers took a single DNA molecule, built of 11 base pairs, and grafted it to an electronic circuit only a few nanometers in size. When they measured the current through the molecule, it did not show any special behavior. But when layers of a molecule called “coralyne” were inserted between layers of DNA, the current increased some 15 times, which is crucial in such a small-scale diode. The researchers were able to construct a molecular rectifier by intercalating (inserting) specific molecules into DNA strands.